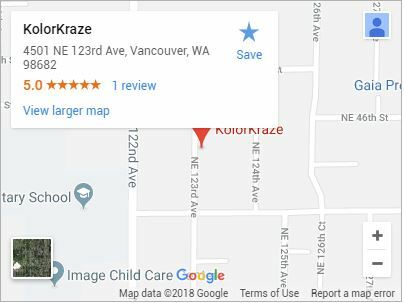 For more than a decade, Kolor Kraze has been enabling Vancouver, Washington business owners to promote their brand with custom signs and banners. But we wouldn’t be doing our job to the best of our ability if we simply created signage and left it up to the owner to install it. Kolor Kraze is comprised of a professional, licensed team who has the experience and skills to help you hang and install signs no matter the size or location. From directional and informational signs for building interiors to lighted outdoor signs, we make it easy to increase visibility and offer clear direction for your customers. Whether it’s a sign to direct street traffic to your store or office, or informational signage to help patients or clients find your suite, we work with you to ensure that each sign is placed logically and prominently. There’s nothing worse for business than confusing signage or marketing. Kolor Kraze works with you to create appealing signs that make sense for your business culture and overall aesthetic. Our experience gives us insight where you might have questions, and our licensed sign installation service means you don’t have to worry about improper displays. The techniques we use don’t rely on guesswork. They involve careful measurements and advanced tools that ensure your signage will be level, highly visible, and built to last. When you choose Kolor Kraze to install your signs, you’re getting licensed and bonded professionals who are committed to precision. We work primarily in Vancouver, WA, but occasionally travel to various parts of the US for custom sign installation. Custom signs. Fast Turnaround Times. If you have pre-made signs that you’d like installed, give us a call for more information on how we can assist you. We are also happy to create brand new signage for you that incorporates high-quality design, materials, and printing. We offer free estimates, quick turnaround times, and free local delivery. Our products are all custom, which means you’re never restricted by standard sizes or “cookie cutter” print features. Call today for sign installation, printing, and vehicle wraps.